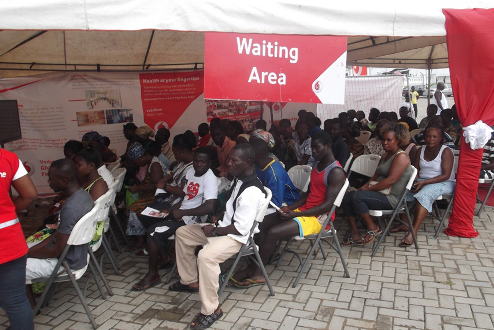 Results from a free health screening exercise organised by Vodafone Ghana Foundation in Duayaw-Nkwanta, the Tano North District capital indicates that cases of hepatitis ‘B’ is on the increase in the town. Mr David Dorme, a physician assistant at the Sunyani Municipal Hospital, who led the exercise said out of the 400 blood samples screened, majority contained the virus. Mr Dorme noted that bad eating habit, alcoholism and smoking were some of the contributory factors to the spread of the disease in the area. The physician assistant advised those who tested positive to eat more fruits, go for regular checkup and avoid eating at night; he said vaccination and regular medical check-ups were the best way to guard against contracting the disease. He observed that apart from hepatitis ‘B’, cases of hypertension were also high in the area. Head of Vodafone Ghana Foundation, Nana Yaa Ofori-Koree said the charitable arm of the telecom giant is poised to partner government to address living conditions of the vulnerable in society. She noted that since the establishment of the foundation six year ago, more than 20,000 Ghanaians had benefited from the foundation’s health programmes. Mrs. Ofori-Koree said the foundation offered ultra-scan to pregnant women in Eastern and Western regions, as well as provided them free medication for specific ailments.